COMPLIANCE & AUDIT in satisfactory condition? What do the struts look like? How Risk about the welds? Is there any damage that would weaken them? Some insurance companies have begun to ask that sur- • Rudders: How many rudders are there? What shape veyors to look at risk factors beyond the vessel. Today, in are they in? What is the condition of the tubes, shafts and addition to detailing the structure and equipment on a bearings? Are the rudder bearing clearances within allow- boat, I am looking at your Safety Management System, able clearances? What shape is the ? ange in? Is there exces- Maintenance Program, Crew Competency and Vessel Op- sive wear? Is the shaft bent or deformed? erations. This will grow as Sub M requires the surveyors to • Through Hull Fittings and Valves: How many perform some audit functions and your auditors are look- through hull ? ttings are on the vessel? Where are they? What ing at your vessel and your crew. shape are they in? 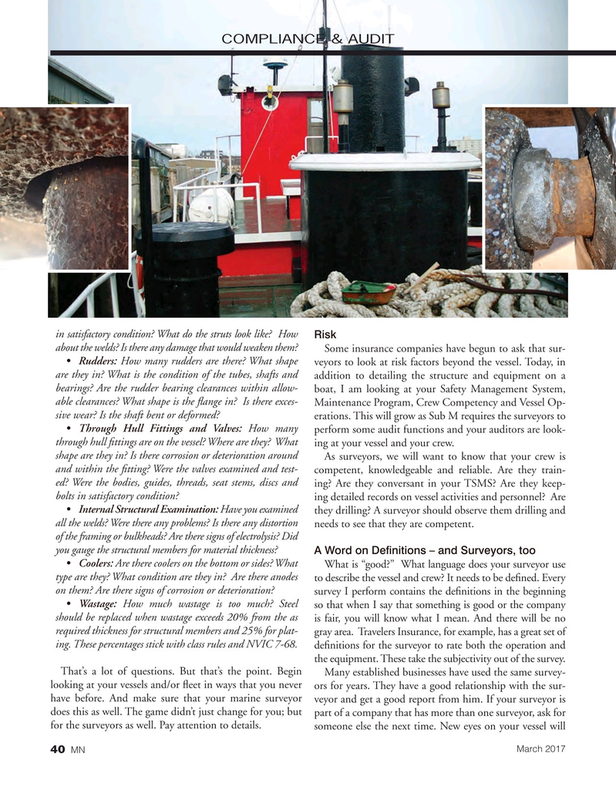 Is there corrosion or deterioration around As surveyors, we will want to know that your crew is and within the ? tting? Were the valves examined and test- competent, knowledgeable and reliable. Are they train- ed? Were the bodies, guides, threads, seat stems, discs and ing? Are they conversant in your TSMS? Are they keep- bolts in satisfactory condition? ing detailed records on vessel activities and personnel? Are • Internal Structural Examination: Have you examined they drilling? A surveyor should observe them drilling and all the welds? Were there any problems? Is there any distortion needs to see that they are competent.